1. A.A. Milne had a famous schoolteacher. A.A. Milne’s father John ran a small boys’ school, Henley House, and one of the teachers he employed was a young H.G. Wells. Wells was a few years away from publishing his first novel, The Time Machine, when he had a post at Henley House 1889-90 and taught Milne mathematics. It obviously rubbed off, as that was the subject Milne read at Cambridge. 2. He wrote a very prescient play about Christopher Robin. Almost. Before the success of Winnie the Pooh et al, and indeed before Christopher Robin was born, Milne was a very successful playwright. One of his early plays was The Great Broxopp, about the resentment a child felt against the father who had used his name and image in a popular advertisement … the same resentment Christopher Milne would later feel about being Christopher Robin. 4. He had a couple of literary feuds. He led the charge against P.G. Wodehouse and his ‘Berlin Broadcasts’ (Wodehouse would later comment ‘Nobody could be more anxious than myself that Alan Alexander Milne should trip over a loose boot-lace and break his neck’, while adding that he still loved Milne’s writing). He also fell out with Dorothy Parker, who finished her review of The House at Pooh Corner saying ‘Tonstant Weader fwowed up’. Twenty years later, Milne quoted the review in his autobiography, adding ‘[sic, if I may]’. 5. He unknowingly caused a Latin bestseller. Alexander Lennard’s translation of Winnie-the-Pooh – Winnie ille Pu – was published in 1958, two years after Milne’s death, and in 1960 became the only work in Latin ever to appear in the New York Times’ bestseller list. Not bad for a bear of very little brain. Simon Thomas is one of the founders of Shiny New Books, where this post originally appeared. 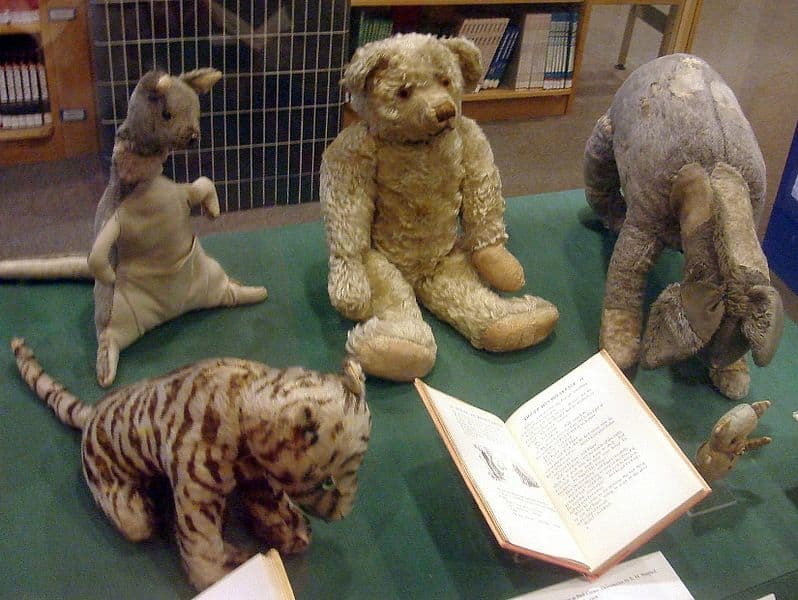 Image: Original Winnie the Pooh stuffed toys. Clockwise from bottom left: Tigger, Kanga, Edward Bear (aka Winnie-the-Pooh), Eeyore, and Piglet. Author: Spictacular; public domain. I did my presentation unit in Children’s Lit over A.A.Milne and love the rich history and interesting tid-bits that fill up all of his life. These are no exception! Thank you for this post! Thanks so much for posting this here – A A Milne was a fascinating man, and I had fun putting together five facts. Honoured to appear in the series! I’ve always loved the Pooh/Christopher Robin books. It’s so cool to hear that Milne knew HG Wells! Hello I have nominated you for the Liebster Award. Check out my blog for details! Not too long ago I also posted about A.A. Milne’ a classic himself! Great post! How wonderful to have H.G Wells as his teacher. Really fascinating facts. I love Milne and Wells. Nice to know that they know each other. Really fascinating facts. Thanks for this! Some very interesting facts about the author of a true classic of children’s literature, Winnie – the – Pooh.